We have mentioned it elsewhere on this website, but we feel it is worth repeating: when it comes to luxury wedding venues in downtown Washington, DC, it does not get any better than The St. Regis Washington, D.C. Everything about the hotel is designed to give wedding clients and all of their guests the most luxurious, elegant and opulent experience possible. From the moment you step into the locale’s lobby, with its sumptuous red velvet window treatments and ornate chandeliers, you are treated to high-end wedding services that you cannot find in too many other places. And all this opulence will show in the photos of your marriage celebrations a similar touch of elegance. If you are the type of person who wants couples portraits of you and your fiancé surrounded by dark, heavy wood furniture, plush carpeting and gleaming crystal, then The St. Regis Washington, D.C. has got you covered! One of the St. Regis’s biggest selling points, in our opinion as professional wedding photographers, is its excellent staff. Many wedding venues have beautiful interiors with luxurious furnishings, but what will often make or break the experience that you have holding your nuptials is the service that you receive in the locale that you choose. You want to work with a site coordinator who understands your needs and finds creative ways to get you what you’re looking for, even if it is not something that the wedding venue typically offers. Having worked with the staff responsible for matrimonial events at the St. Regis, we can tell you from experience that this is a group of people you can count on to help you organize the wedding of your dreams. Efficient, friendly and responsive, the events team is a great resource for brides and grooms getting married in Washington, DC. 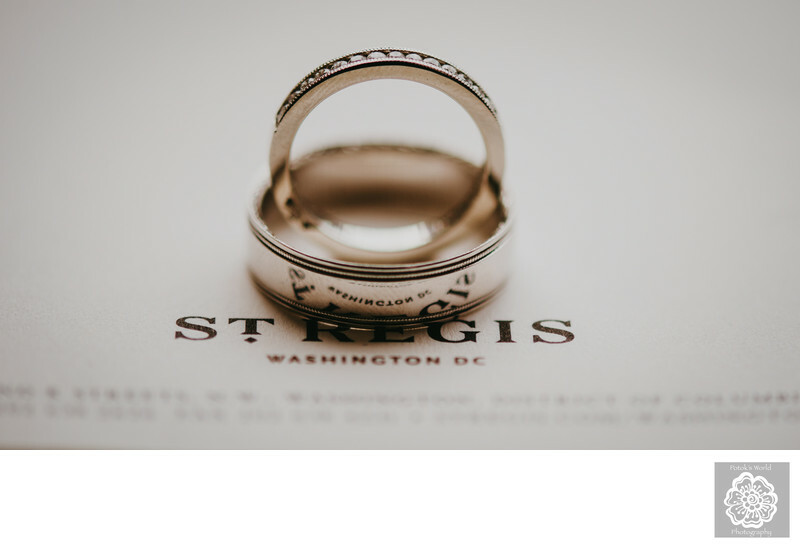 Speaking of the Nation’s Capital, we should also note that The St. Regis Washington, D.C. is located in the perfect spot for having a typically Washingtonian matrimonial event. The hotel is just two blocks from arguably the most famous attraction in the city: The White House. Just on the other side of that iconic landmark is the National Mall, specifically the part of it from which the Washington Monument rises. This makes the St. Regis not only an ideal venue for your giving out-of-town wedding guests a lot of fun options for their downtime, but also for getting some beautiful and classic Washington, DC wedding photos! If you want DC icons as the backdrop for your marriage photography, you are close to a lot of them. One last great thing about the St. Regis is that it even offers future spouses the possibility of having an outdoor wedding in the heart of Washington. The hotel has a small courtyard just to the side of its main building where couples can exchange their vows with the open sky above them. Though the courtyard technically opens to the sidewalk, the lush trees and bushes planted around the gate protect the privacy of those saying, “I do” on the inside. Location: The St. Regis Washington, D.C.,923 16th St NW, Washington, DC 20006. Keywords: St. Regis DC Weddings (3).